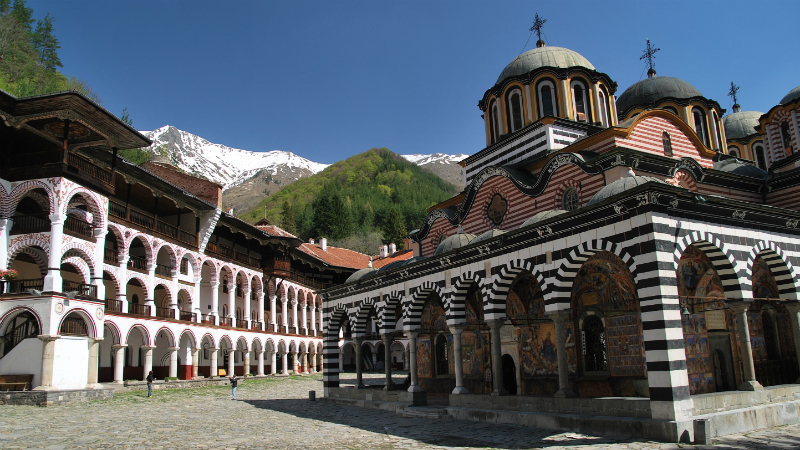 Rila Monastery and Boyana Church minibus shuttle from Sofia. NEW: EVERY THURSDAY & SATURDAY FROM THE FIRST OF APRIL THE TOUR WILL BE OFFERED NOT ONLY IN ENGLISH, BUT IN SPANISH AS WELL! 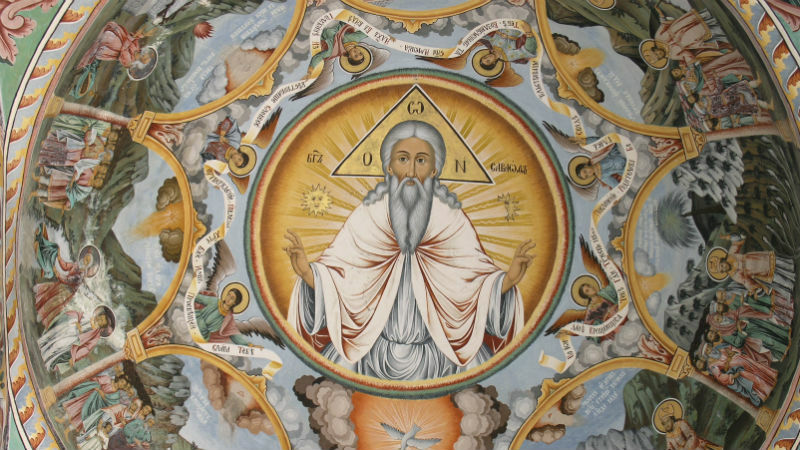 The Boyana Church's frescoes bring epochal change in the mural painting and are considered predecessors of the European Renaissance. The majority of more than 240 figures depicted there have individuality, vitality and psychological depth. The tour’s departure point is St. Alexander Nevski Square (south-east corner; at the parking lot in front of La Cattedrale restaurant. You will receive a map with instructions after completing the booking). Hotel pick-up can be ordered, but is surcharged 5 euro per booking. The tour concludes in the afternoon with drop off at Al. Nevski Cathedral. Please click on the Map on this website to see the meeting point location. - Advance booking is required! Showing up without a reservation will not guarantee you a seat on the bus. 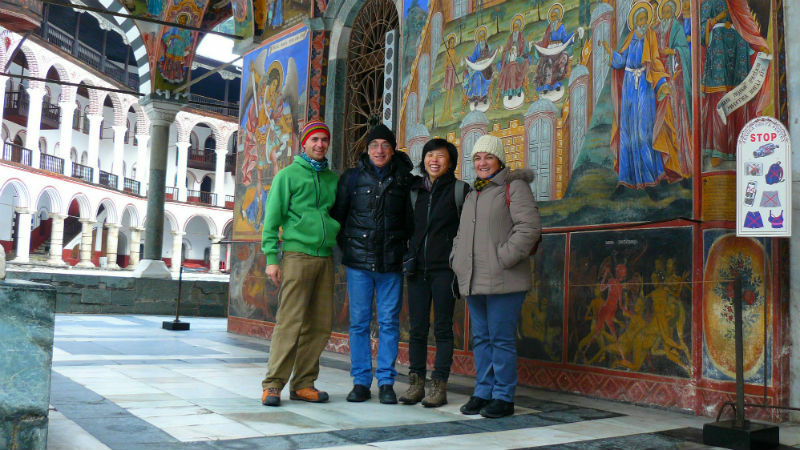 12:00: Estimated time of arrival at Rila Monastery. 14:30-15:00: We depart from Rila Monastery and head back to Sofia. 16:30-17:30: Back at Alexandar Nevski Cathedral. Group size: The groups vary between 8 (small groups), 16 (medium groups) and more than 20 people (big groups). Kindly note that the group size is not upon request. CHILDREN DISCOUNTS: Children between 5 - 12 years old are subject to a discount of 5 Euro. Please be advised that the tour is not suitable for children under 5 years old. HOTEL PICK-UP: Between 5 and 10 Euro per booking, depending on your hotel location. Please be ready at least 5 minutes earlier! 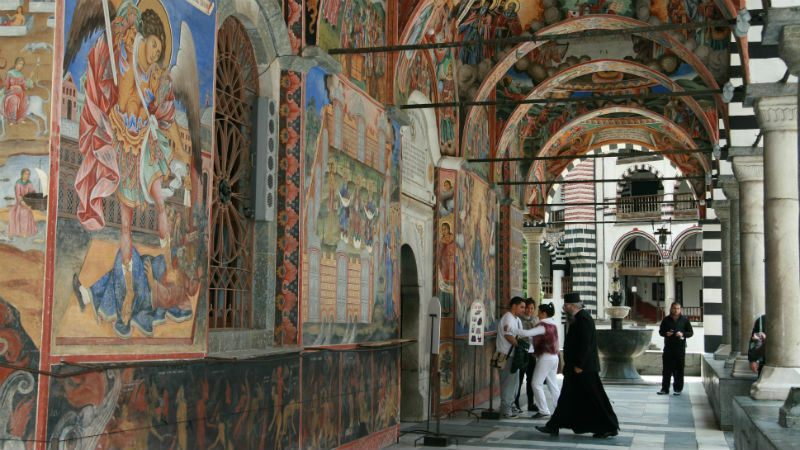 AUDIO GUIDES: An audio guide for the Rila Monastery in Spanish, Italian, German and Russian is available with a supplement of 5 Euro per person. 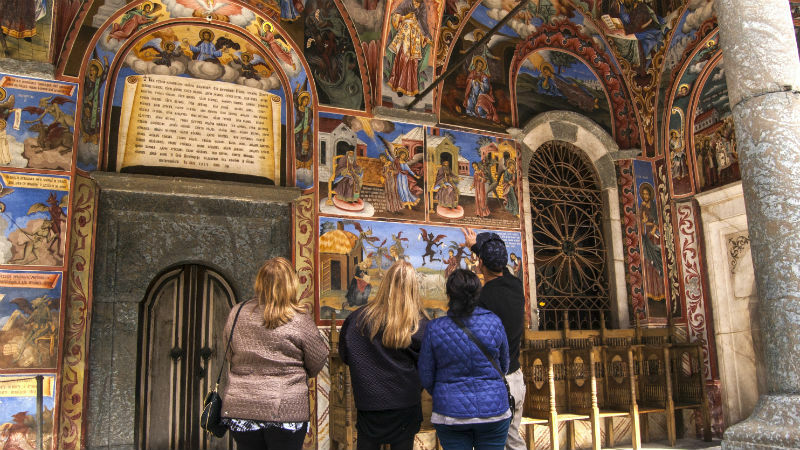 Enjoy a comprehensive 1 hour professionally recorded commentary on Rila and Vitosha Mountains, Rila Monastery Architecture, History and Frescoes. WWF DANUBE-CARPATHIAN PROGRAM DONATIONS (wwf.bg): Traventuria Ltd is an environmentally responsible company that supports the work of the World Wide Fund. You can also help by donating funds for their activities during the booking process. 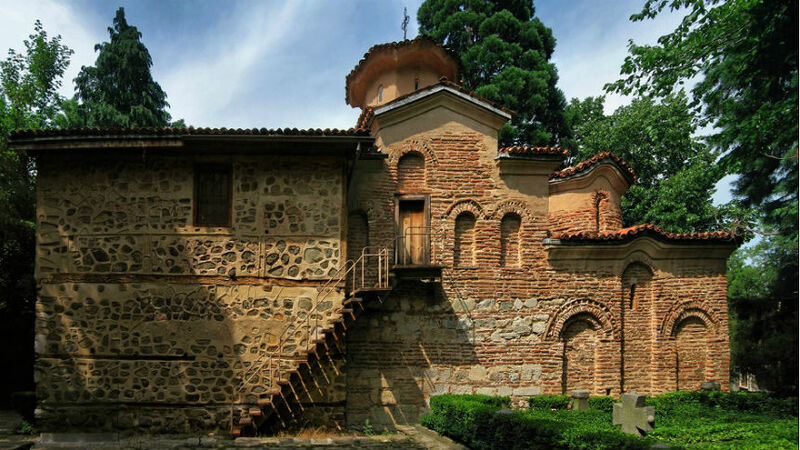 PLEASE NOTE: The time spent inside the Boyana church is limited to a maximum of 10 minutes, as a preservation measurement for the UNESCO World Heritage site's fragile frescos. 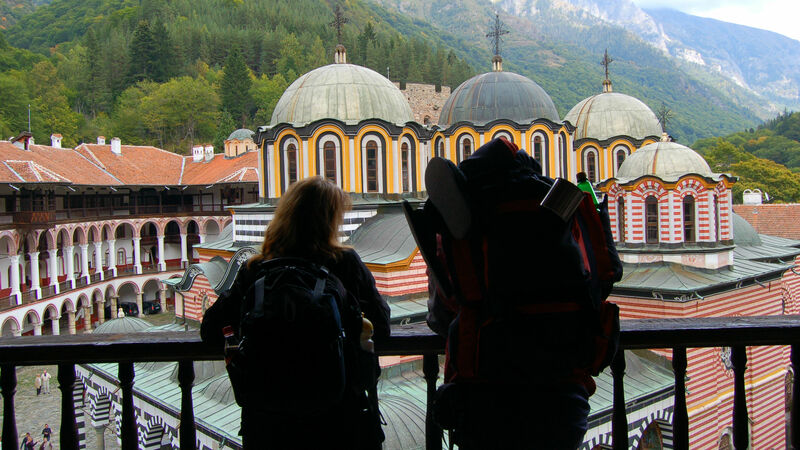 It is better to prepare a lunch pack and use the free time at the Rila monastery for exploration and contemplation. Meet up time at 08:45 from Al. Nevski Cathedral�s square (south-east corner) OR, in case you have ordered a hotel pick up, from your accommodation between 08:10 and 09:30; Drop off on the Alexander Nevski cathedral at appr. 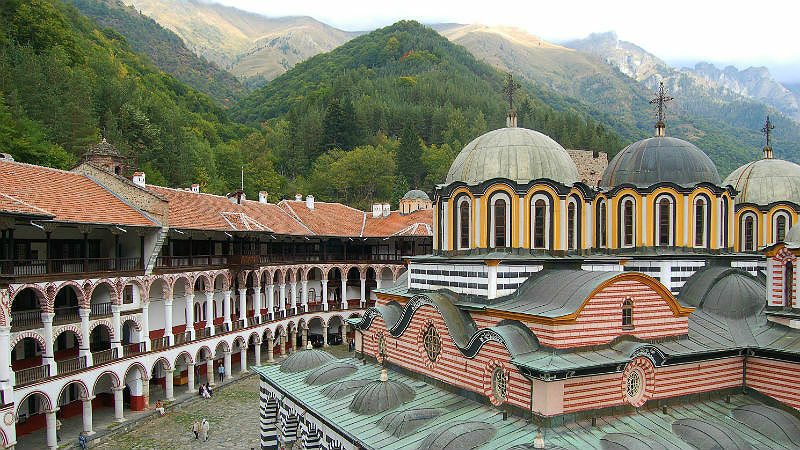 17:00; all transportation costs along the route Sofia - Rila Monastery - Boyana Church � Sofia; English- speaking driver; parking fee and road taxes Clients who have booked hotel pickup may be contacted additionally for confirmation of the time of pickup. Dress code: Long trousers/skirts (at least knee-long), no sleeveless tops (bring a piece of clothing to cover your shoulders). Emergency telephone: +359 884 743 868 Due to the lack of adequate dining options, we recommend for people wishing to spend more own time at Rila Monastery to bring their own lunch.